The Bible definition of restitution is payment for something misused, whether it is defined in the Hebrew, Greek or English. Restitution under the Law of Moses demands the return or compensation to the owner of that which was lost, stolen, abused, or damaged. Whom the heaven must receive until the times of restitution of all things, which God hath spoken by the mouth of all his holy prophets since the world began. 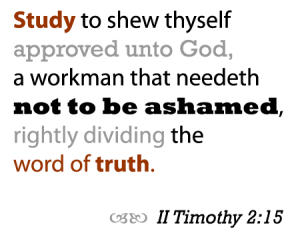 (Acts 3:21 KJV). Peter is preaching to the men of the nation of Israel (Acts 3:12) who agreed with their leaders in rejection and crucifixion of Christ. Jesus ascended back into heaven after His resurrection and the promise is that He will return. Peter deals with the most important issue first: Israel’s (not the sinner in the age of grace) sins blotted out. This remission of sins will occur “when the times of refreshing come”. Of importance to notice, is that this blotting out or remission, total removal of sins, can not happen BEFORE (until ) Jesus returns, “when the times of refreshing” will come to Israel. These “times” will not happen without the Lord’s first returning to Israel. So we see TWO “times” spoken of in Acts 3:19-21: one of “refreshing” and one of “restitution” (payment for wrong done): one of blessing and one that demands a payment to be made BEFORE the blessing. Correct prophetic interpretation of the Bible depends upon believing both will literally occur. But, correct interpretation demands that each of these “times” be properly defined by Bible usage and context. Notice: The above is approximately 1/6th of the full study. If you would like to receive the full study, please request it from davereese6@msn.com. The complete study will be sent at no obligation.